We are all familiar with ugly public space, the shabby streets, parks and squares that we walk past every day, the kind that could do with some care and attention to make them that little bit more attractive to hang about in. Given this is where we spend much of our time, our surroundings could do with being pleasant. In the last few decades there has been an attempt to improve these spaces with the proliferation of commissioned public art, but this has had, shall we say, uneven results, with a number of unbidden and ultimately unwanted sculptures springing up all over the country, provoking angry reactions. But there have been a number of successful pieces in Scotland in the last few years and these are worth paying attention to, partly to figure out what works. 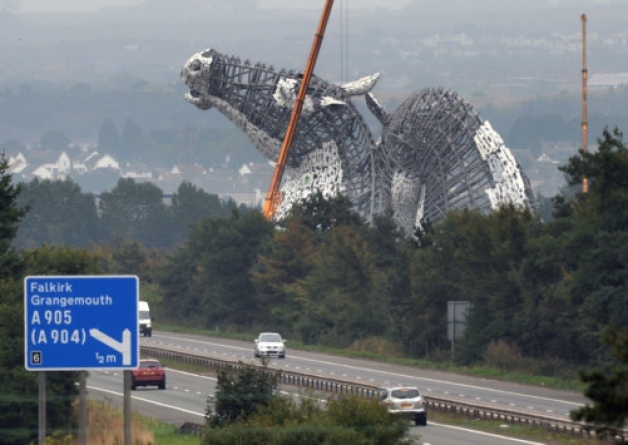 I predict that The Kelpies, a colossal monument of two horse heads made out of 600 tonnes of steel by sculptor Andy Scott, which has just been unveiled near Falkirk, will be one such success. Click here to read on.